It’s that time of the year when gift baskets start to show up at the office. We appreciate the gesture, and many of us appreciate the stuff inside the baskets. With some exceptions. There has been one particular basket that has been in the break room for a week or so, and it is completely empty. Except for the half bag of Huckleberry popcorn. You may ask, “Hey, what is Huckleberry popcorn?” To which I’d have to answer, “I don’t know,” because I’m not putting that stuff in my mouth. Apparently someone has eaten some of it. But the fact that it’s still there after a week tells me it is not currently the most popular thing in the room. 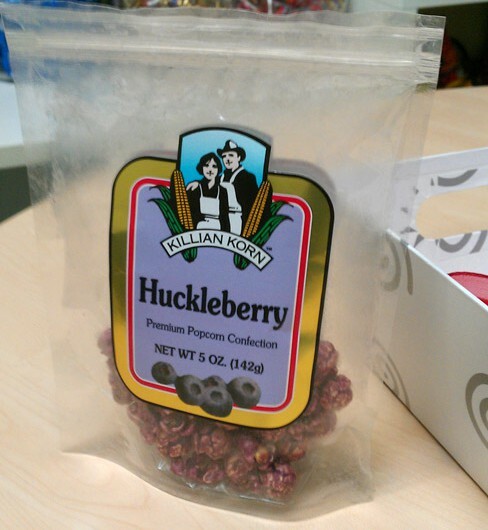 If anyone wants to try Huckleberry popcorn I’ll send it to you. But I can’t be responsible for what happens to you if you eat it. You’ll have to sign a waiver of some sort. At the very least.